Brighton Rock, Theatre Royal Brighton. Photo: Karl Andre. 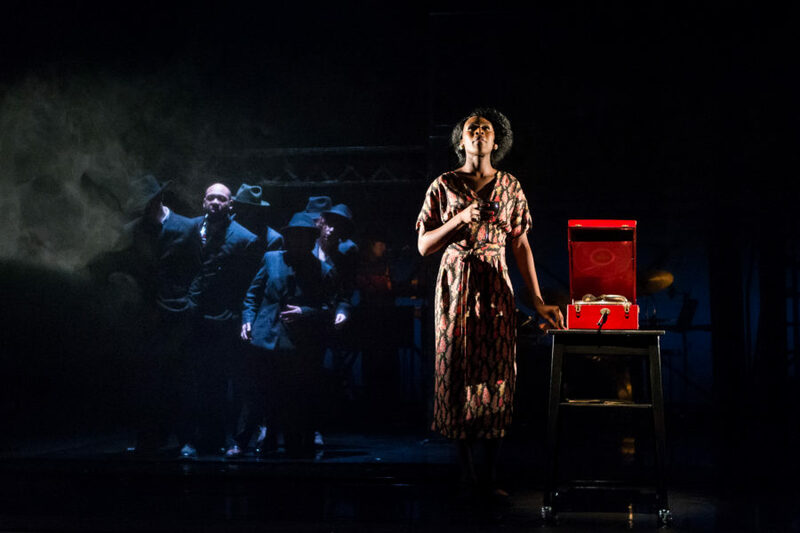 There is something oddly resonant in seeing Bryony Lavery’s new adaptation of Brighton Rock not just staged in that city’s Theatre Royal, but also on a day where, for much of the morning, a heavy layer of mist rendered most of the seafront invisible, like a backdrop someone had forgotten to paint. Because this is not the Brighton of shiny lights and sunny days: it is a city of shadows and things half-glimpsed, where anything – any threat – might emerge from the murk. It is this darker underbelly of Brighton that is Pinkie’s domain. A gangster boy-king, thrust into power by the death of his leader and sheer force of will, Jacob James Beswick’s Pinkie is all angles and pent-up anger. Hands thrust into pockets, jaw set, he struts and postures so convincingly that you only see how completely out of his depth he is as his scheming starts to unravel. Although Pinkie is by far the showiest part, Beswick is well-matched by Sarah Middleton as Rose, the naïve waitress whose witness testimony could endanger him and his gang. The production wisely makes much of their youth, which goes some way to rendering their relationship halfway believable – Pinkie is so vile to Rose from the off that it’s always a hard sell, but here at least it’s mitigated by the fact that they are so palpably teenagers, both, in their own way, clueless about this aspect of the grown up world. The real heart of the show, though, is Gloria Onitiri’s Ida. She’s vibrant and warm, her clothes a vivid splash of colour, her fierce sense of justice a striking contrast to the moral equivocation of Pinkie’s – and even Rose’s – version of Catholicism, where any sin can be wiped clean with some last-minute contrition. A strong supporting cast ably plays multiple roles, under the taut and fluid direction of Esther Richardson. And right from its unsettling start, the show uses Sara Perks’ striking set incredibly well, the cast as precisely choreographed as a ballet. They insinuate themselves between the stairs of a shifting staircase, they clamber and scamper, shedding characters as they go – two good-time girls become two gangsters with the shrugging on of a coat. It gives the piece a sense of pervading menace, with no one and nothing quite what they seem. Brighton Rock is at Brighton Theatre Royal until March 10th. For more details and future tour dates, click here.